In her latest novel, Unsheltered, American novelist Barbara Kingsolver takes on the modern American condition and tries, in some way, to dig beneath the rise of Donald Trump. She tells two very different stories over two timeframes – the near present and the distant past – to lead readers, not too subtly to a particular view of modern America. The first story is set in 2016, in the leadup to the last presidential election. Willa and her husband Iano have moved into a crumbling mansion in the New Jersey suburb of Vineland. With them in the house are Iano’s ailing father and their daughter Tig (Antigone). But after a tragedy strikes, her son and his newborn baby also move in. The family does not have the money for Iano’s father’s medic al bills never mind enough to fix the house that is slowly disintegrating around them and in desperation Willa looks for a historical tie that might attract some heritage funding. Back in 1871, school teacher Thatcher Greenwood has moved into the very new community of Vineland. Vineland itself is the vision of an entrepreneur Charles Landis, a Trump-like character who controlled the town media and politics, and in Thatcher’s case, the curriculum at the school. Thatcher makes a connection with his neighbour Mary Treat, a naturalist who communicated regularly with Charles Darwin, but runs into trouble when he tries to teach the children in his class about evolution, against the wishes of the evangelical principal. The stories play out in parallel. Willa’s is one of desperation and despair at the state of modern America. Whether it is the health care system which is failing her Trump-supporting father-in-law or the lack of a social welfare safety net or the fact that after a lifetime of work neither she nor or husband are secure enough themselves or able to provide security for their children. Whereas Thatcher has a more local administration to buck against so takes more direct action but is ultimately unsuccessful in the face of a system that lets Landis walk free after shooting another man in broad daylight (this true event linked directly to Trump’s statement during the campaign that he could should someone on Fifth Avenue and people would still vote for him). There is plenty of polemic here. Characters in the 2016 sections seem to spend an inordinate amount of their time discussing the state of America, the world economy and the question of sustainability. And, the point of the historical sections while more engaging, seeming to be that for all of its achievements, America has not really changed very much in one hundred and fifty years – still ready to fall for a huckster blowhard with the most money who will sell people something that not only he cannot deliver but that they will end up paying for themselves. 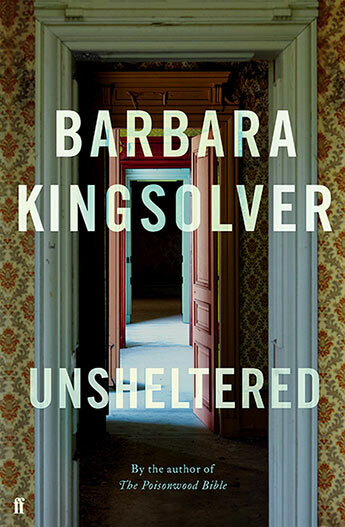 Time and again throughout the narrative, Kingsolver and her characters return to the concept of shelter and the positives and negatives of losing your physical and metaphorical shelter. It is easy to either agree or disagree with Kingsolver (and her characters’) political positions. She provides plenty of illustrations of not only what is wrong with America at the moment but, in using her historical narrative to some extent, why. But there is not much else to this book. There is plenty of didacticism here at the expense of plot or even, in some respects, character. So that, in the end, Unsheltered feels like a beautifully written, agonisingly and depressingly observed political treatise for progressives.